Ms. SNIP: I took away Amy’s key to the club. Ms. SNIP: She told some people that I was not organized. Ms. SNIPE: Well, that’s true isn’t it? Ms. SNIP: That’s not the point. She gave an unfavorable opinion about me to my other people. She has no right to do that, she should only say nice things about me. After all, I had let her keep the key for all this time. Ms. SNIPE: I know, but everyone is entitled to give their opinion, even when it isn’t always complimentary. 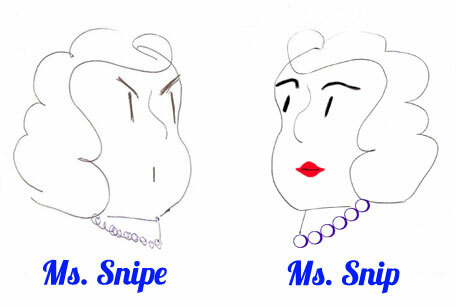 Ms. SNIP: Not when they are talking about me they don’t. If you mention my name or refer to me it should be with admiration only. If someone says something less than complimentary, they should be reprimanded in a significant way. That’s what BC (Big Crybaby) does and he’s in charge. 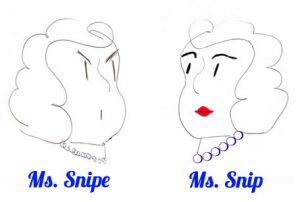 Ms. SNIPE: You – and he– seem to have forgotten that he is in charge of some things but no one is in charge of people’s opinions. If you – or he – don’t like it, that’s your prerogative however, you can’t lock someone out just because they have an opinion that you find hurtful. Ms. SNIP: Well, she’s out and I’m thinking there will be more keyless people soon. I’m keeping track of what people say. By the way, have you talked to anyone lately? Ms. SNIPE: I guess we just have to disagree on this for now. Ms. SNIP: Also, I wanted to let you know that I applied for a job and put you down as a reference. Ms. SNIPE: That’s fine. Thanks for letting me know. What job are you applying for? Ms. SNIP: I heard a rumor that Goldilocks (GL) might be leaving her big job as counsel/advisor/spin master to BC. Seems her Papa Bear doesn’t care much for her employer. Ms. SNIPE: Are you really qualified for that position? That’s what SQ relates to BC. He feels sure she is right. After all, he appointed her SQ. Later, when a reporter asks GL how this could possibly be a valid way to rate school buildings in an area she might say something like, “BC is very supportive of schools. He thinks schools are important for community well-being. He believes they provide a realistic picture of the background and community of the people in the area. He wants a community’s schools to bring the people together for growth. This great community togetherness will result in economic growth and jobs, jobs, jobs. He is clearly one who supports all people” (not just his pale, monied pals). See, I could manage to create that kind of spin with a little practice. Ms. SNIPE: Maybe you should just stay away from political issues and find something uplifting to watch on TV. Take a hiatus from the animal-named channel. Maybe Disney or Hallmark channels!